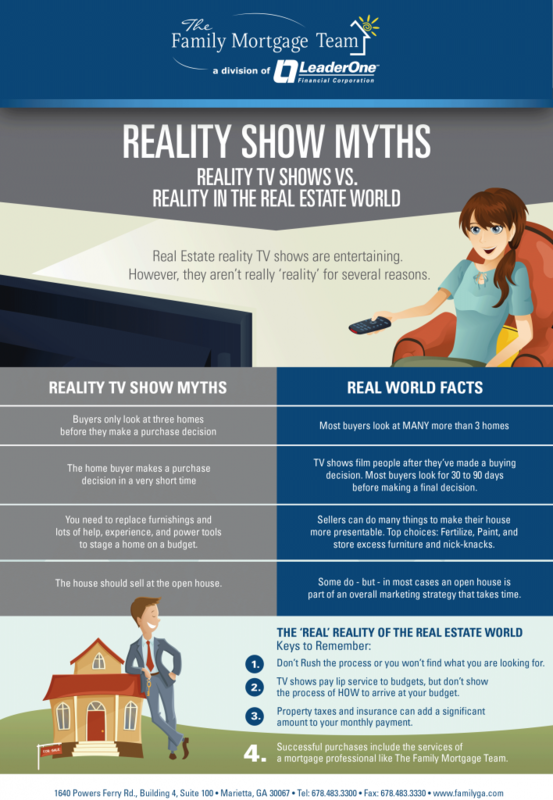 It’s safe to say, most people are aware of the ever-so-popular home buying reality TV shows. And it’s probably also safe to say most people watch, have watched, or have at least been in the room while someone watched one of these shows… Property Virgins, Love it or List It, House Hunters, Property Brothers… and the list goes on. And what makes them exciting on a personal level is when you realize the episode about to come on is set in Atlanta or in your hometown. However, like most ‘reality’ TV these days, there are few parallels between what you see in those shows and how it works in real life. It’s easy to get caught up in the excitement of buying a new home, but remember to keep yourself grounded. This is one of the largest purchases many individuals and families make, so that’s where we come into play; we’re here to help you fully understand what financial options best fit your reality! And through the combination of a great Realtor and a trusted Lender, we can make your reality feel like something you’d see on TV! Click HERE to see Atlanta’s Mortgage Rates! Have questions? Call us @ 678-483-3300 we’re happy to be of service. Need a great Realtor recommendation? We can give you one!